Asclepias exaltata perennial herb from a rhizome, stem 50-150 cm tall, sap milky. Leaves opposite, 7-11 pairs, stalk 1-2 cm long, blade 10-30 cm long, 10 cm wide, broadly elliptic, thin, elongate-pointed at both ends, usually hairless. 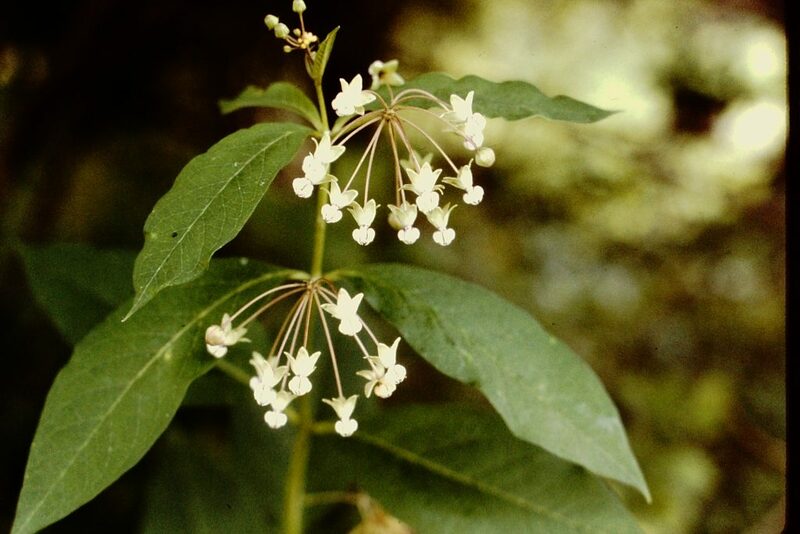 Flowers white to dull purple, radially symmetrical (regular), petal lobes to 1 cm long, hoods 0.4 cm (see A. syriaca); inflorescence of loose, few-flowered umbels in upper axils and end of stem, flowers often drooping on stalks to 5 cm long; June-July. Asclepias exaltata (poke-milkweed) fruit. © K. Chayka. Minnesota Wildflowers. minnesotawildflowers.info (Accessed 10/2017). 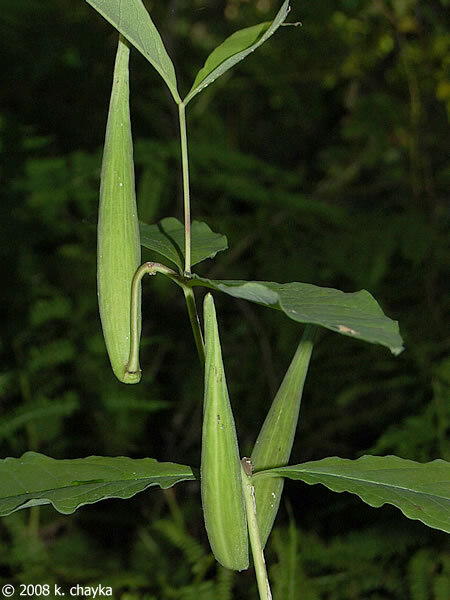 Fruit dry pods, narrow, to 15 cm long, erect, stalks bent, splitting open lenghtwise to release plumed seeds, wind dispersed.